Divergent is what I’d like to call a ‘nice’ movie. There’s nothing here terrible offensive but at the same time, it doesn’t break new ground either. The direction is more than adequate and the performance by Shailene Woodley is strong. But for all the good, the story structure is odd. Note: This review contains major spoilers concerning the plot. Please skip this section if you don’t want to learn details about the plot. Note #2: This review was copied from my original review written back in 2014 and updated for the UHD release. Courtesy of the Twilight Saga, also from Summit, every studio seemingly snatched up any available Young Adult property in the hopes of finding the same (financial) success. Summit struck gold again with The Hunger Games ($1.55 BILLION worldwide total between the two HG films). And now they’ve return back to the well in the hopes that some oil can be drilled. The output is Divergent, a film based on the “Worldwide Bestseller” and although it’s not bad, it should’ve and had the opportunity to be so much better. Our story begins in an undetermined despotic future in Chicago where the outside world is scorched earth due to some world war and inside the city citizens are broken up into what are called factions: Abnegation (Selfless), Erudite (Intelligent), Dauntless (Brave), Amity (Peaceful) and Candor (Honest). If you don’t belong to any one of these, you are considered “Factionless”, people who did not complete their initiations into the faction and are more or less cast out to fend for themselves doing the work others won’t do (i.e. janitors, constructions workers, etc.) and in exchange receive the basic necessities to live. Although this aptitude test may put them in a faction, it is up to the individual to choose and once it’s made, in what’s aptly called the “Choosing Ceremony”, there’s no going back. And then there are those who don’t fit any and yet every category: Divergent. Upon taking test, administered by a woman named Tori (MAGGIE Q), our main character, Beatrice Prior (SHAILENE WOODLEY), is given sage advice to not tell anyone and shoves her out the back door. In the meantime, there is also political (faction) turmoil going on as the Abnegation, to which Beatrice and her family belongs, with her father (TONY GOLDWYN) working closely with the faction leader (RAY STEVENSON) and mother (ASHLEY JUDD) handling the household duties along with the daily routine of helping the factionless as prescribed to the Abnegation faction. She also has a twin brother, Caleb (ANSEL ELGORT), who chose to. However, it is believed someone within the Erudite faction is spreading nasty rumors about the Abnegation leader, though it’s not hard to guess that it’s in fact faction leader Jeanine Matthews (KATE WINSLET). At the Choosing Ceremony, despite being thought of to choose her family’s tradition and go with Abnegation, she instead goes with Dauntless, a faction she has admired all her life. Now the real work begins as the Dauntless are, of course, known for being fearless so she first has to jump from a moving monorail to a rooftop, on said rooftop, where she meets the incredulous Dauntless leader Eric (JAI COURTNEY), must then jump off a ledge down a dark hole to a waiting net at the bottom. Being the first one to volunteer, she also gets introduced to who we know will be the love interest, Four (THEO JAMES), faction transfer instructor. At this point, she also is given the chance to change her name to which she chooses “Tris”. So begins the strenuous training where she bonds with a Candor named Christina (ZOE KRAVITZ), while also butting heads with our resident jackass, Peter (MILES TELLER), who looks down on Tris’s kind (the Abnegation nicknamed “Stiffs”). As she struggles with the training, and with the Dauntless keeping only some of the transfers which would leave the rest factionless, she also learns that somebody is hunting down the Divergent kind for their independent thinking so she must tread lightly not being able to trust anyone. 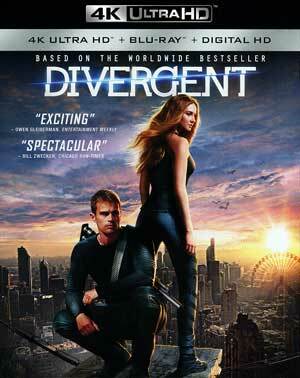 So, where does Divergent stand compared with the numerous other Young Adult adaptations? Well, perhaps not quite as good as The Hunger Games (Catching Fire especially), but it’s far better than anything the Twilight Saga brought in just about every category and despite some issues with the story structure where the training part took up the bulk of the film and the main plot, involving drone soldiers killing innocents, seems like merely a minor plot point quickly, and relatively easily, resolved at the end. Still, this is an enjoyable and entertaining flick thanks in no small part to the casting of Shailene Woodley who is Hollywood’s “It Girl” starring in other high profile projects including The Fault in Our Stars. In Divergent she has amazing screen presence and in conjunction with some good on-screen chemistry with Theo James (of “Downton Abbey” fame), it makes one ignore any issues with the plot. Aside from Woodley and James, the film does sport an impressive array of supporting actors from Kate Winslet, Tony Goldwyn, Ashley Judd and Ray Stevenson, all of whom parts are fairly limited — though with Winslet her role should expand with each sequel —, to young on-the-rise talents such as Zoë Kravitz (daughter of Lenny Kravitz and Lisa Bonet), Miles Teller (The Spectacular Now), Ansel Elgort (Carrie) and the more experienced Jai Courtney playing a fine blowhard antagonist; and for his part, he’s far better than in some of the drivel (looking at you A Good Day to Die Hard!). 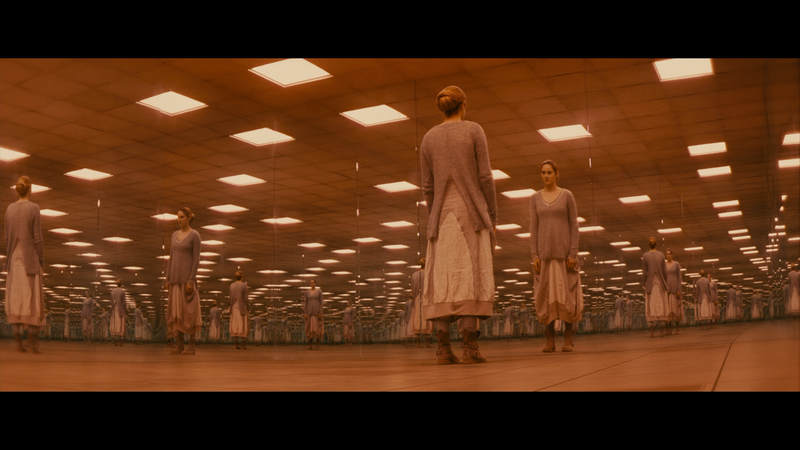 Divergent was helmed by Neil Burger who I suspect was a director-for-hire and for the most part, it’s a perfectly adequate outing for the filmmaking presenting nice visuals (though the visual effects itself are a bit off) and moves the unusual story structure along at a brisk pace. Burger’s filmography is interesting from the mundane (The Lucky Ones) to downright incredible (The Illusionist is still one of my favorites, unfortunately overshadowed by The Prestige) and although this won’t rank very high amongst his others, he serves as a fine fill-in to introduce this world. This release comes with a glossy slip cover. Inside the case is a retail Blu-ray Copy and a redemption code for the Digital Copy. Audio Commentaries – Two tracks are included: 1) Director Neil Berger and 2) Producers Douglas Wick and Lucy Fisher. Each of these provide different perspectives with Berger giving the filmmaking POV on how shots were filmed, working with the actors and such while the producers are mostly about translating the source material into feature film. Bringing Divergent to Life (47:17; HD) is a four-part behind-the-scenes documentary chronicling how the project came to life, has some interviews with the cast and crew and we get a look at some of the filmmaking process. Faction Before Blood (14:51; HD) looks at the different factions featured in the movie. 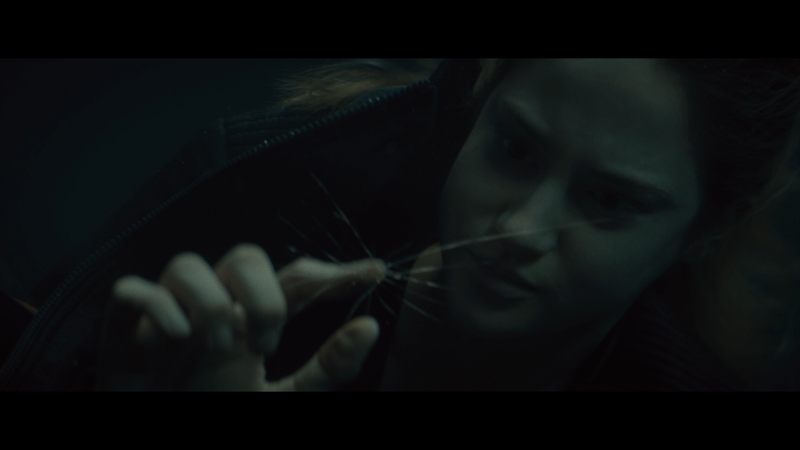 Deleted Scenes (4:27; HD) – These are a selection of scenes removed or trimmed most likely for pacing issues more than anything. Also included is a Music Video (3:48; HD) for “Beating Heart” by Ellie Goulding and a Marketing Gallery containing 2 Theatrical Trailers and a Poster Gallery. Originally shot at 2K resolution, this UHD release of Divergent has been upconverted for 4K televisions and while it’d be nice if this were native 4K, we still get a brilliant looking transfer. Colors are brilliant through and through and detail is sharp and well defined. Now, the golden question is: is this worth the upgrade cost? Probably not as the original Blu-ray already looked fantastic, but anyone new to buying this movie, it’s worth the $10 surcharge. While the Blu-ray release already had an impressive 7.1 DTS-HD Master Audio track, we get a minor upgrade to DTS: X. There’s a tad more depth present with this track by comparison but it’s negligible. Dialogue levels still sound crisp and clean but where the track comes to life is with the various action scenes not to mention Junkie XL’s wonderful score (which I do own and is worth downloading). 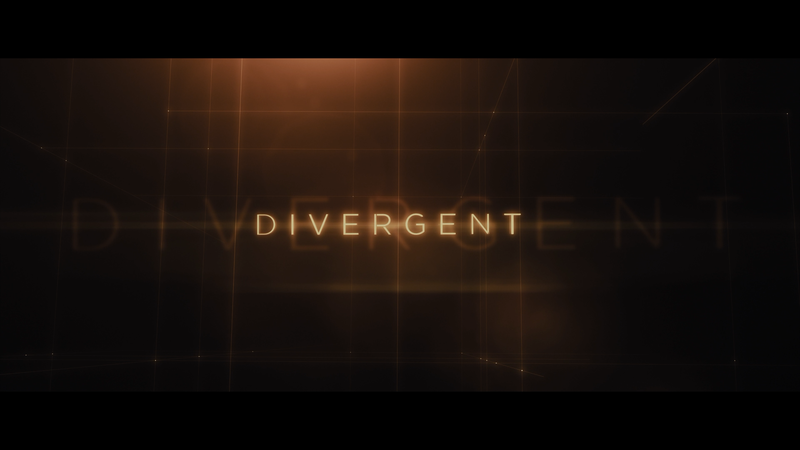 Overall, Divergent is what I’d like to call a ‘nice’ movie. There’s nothing here terrible offensive but at the same time, it doesn’t break new ground either. The direction is more than adequate and the performance by Shailene Woodley is strong. But for all the good, the story structure is odd with the bulk of the time relegated to the training with another plotline almost an afterthought taking over the third act. The UHD released through Lionsgate offers incredible video/audio transfers and a fair number of features releases.